Material: Wool. Type: Smart coat. Label Size: 12. Beautiful Marks & Spencer beige wool mix jacket. It is 50% wool. The stud fastening on front is hidden when fastened. Slightly textured soft feel fabric, beige lining, shaping seams from shoulder at front with 2 inset pockets. Gorgeous Wool Smart Camel Coat Size 14 Good Condition Timeless. Condition is Used. Dispatched with Royal Mail 2nd Class. M&S Camel Coat 100% Wool . Condition is Used. Dispatched with Royal Mail 2nd Class. New stylish and gorgeous warm jacket(blanket coat) from M&S collection size 16. wool blend, with front buttons. 37% wool, 52% polyester and other fibers,dry clean only. (you get the jacket only). full length 37.5", bust 46" with front buttons. Coat is used but remains in an excellent condition with no signs of wear and plenty of life. It is made from 70% New Wool and is lined. It isn't very thick. THE COAT IS BY MARKS & SPENCER SIZE 20. Stunning lambswool and wool mix M&S coat. This is a high quality vintage coat made in the Russian Federation. A really stylish Burberry look checked jacket. Length approx. Great condition. Ladies beige blazer style jacket, single breasted and 3 button cuff. Fully lined. We strive to give you good quality and a great service. A stunning ladies Beige coloured coat by Marks and Spencer. Size 8 UK Petite Fit. Gorgeous Soft 💯 pure new Wool. Four button fastenings. This is pure wool with a satin polyester lining. THIS IS A LOVELY LADIES AUTUMN JACKET FROM MARKS AND SPENCERS IN A SZ 14. MAINLY NAVY IN COLOUR (BASE) WITH REDS/BEIGE/ WITH A SLIGHT SHINEY THREAD RUNNING THROUGH THE FABRIC. ROUND NECK, NO COLLAR. ONLY LIGHTLY WORN WITH ALL OF ITS LIFE LEFT IN IT YET. Amazing Marks and Spencer Pure New Wool Beige Collarless Jacket. 4 button fastening with spare buttons. 2 front pockets. Buttons decoration at cuffs. Fully lined. Size: UK 16. Lining: 100% polyester. Shoulder to sleeve end: 23 in. Pit to sleeve end: 16 in. Two large front pockets. 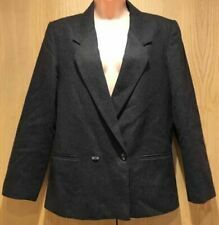 marks and spencer wool coat 10. worn once, in great condition Dispatched with Royal Mail 2nd Class. GORGEOUS WOOL COAT. 53% POLYESTER. 43% POLYESTER. EXCELLENT AS NEW CONDITION. 57% ACETATE. MARKS & SPENCER Ladies Fur Collar Wool Coat Full Length. Colour: Beige. Size: UK 14/42. IN EXCELLENT CLEAN CONDITION. THIS LADIES MARKS AND SPENCER COAT IS:_. 75% NEW WOOL AND 25% POLYAMIDE. BEIGE IN COLOUR. SIZE UK 18. 31" DOWN CENTRE BACK.